Vassar has broken ground on the new “bridge” building of the Integrated Science Center project. This view of the site was taken from the roof of Olmsted Hall, looking down on the intensive work begun this past winter. Suspended over the Fonteyn Kill, the overall 80,000-square-foot structure will dovetail with Olmsted at one end and span 410 feet to its other end at the shoulder of Raymond Avenue. Reclamation of the Fonteyn Kill wetland surrounding the site is essential to the overall project, including efforts by biology professor Margaret Ronsheim to re-establish the adjacent Edith Roberts Ecological Laboratory. Named for the Vassar plant science professor who originated and cultivated the four-acre plot from the 1920s through the 1940s, the outdoor laboratory was the first of its kind and eventually included specimens of all of the native plants in Dutchess County—nearly 2,000 different varieties. Learn more about science at Vassar at science.vassar.edu. 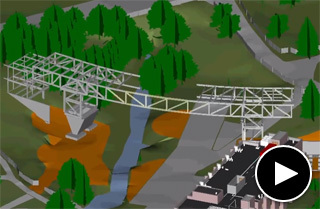 View an animation showing construction plans for Vassar’s proposed “bridge” building. The process has more in common with the building of actual bridges than you may have imagined!